Art museums in the West are increasingly welcoming dance into their space, which has been traditionally reserved for static paintings, objects and at most films, videos. This growing trend is certainly not a recent invention as live performances have occasionally found its way into museums. However, the invasion of dance in this formal architecture over the past several years is not the same: “Museums are now offering performance spaces beyond just the gardens and basements and unannounced hallways” . Work/ Travail/ Arbeid is an adaptation of her previous piece Vortex Temporum (2013), which was originally conceived for the stage. While the latter was a one-hour piece, Work expands into a 9-hour cycle when brought into the MoMA. There is no apparent beginning or ending, but rather the cycles of choreography interweaves with and morphes into each other, distorting the notion of seeing a dance as a fixed-duration product that the spectators can consume. With this piece, Keersmaeker utilizes what she does best: her crystal clear formal structure and her mesmerizing geometrical patterns. Keersmaeker delves deeply into the relationship between movements and music, and how they can both construct a sense of time: “the time of humans, the time of whales and the time of insects” . In other words, she wants to investigate three types of temporality: “normal,” slow, and fast. Hence, each dancer is paired with a live musician, together playing with layered motifs of speed, intensity, and quality of movements and music, creating multiple vortexes of temporality. I arrive there at the MoMA right when the dance started (which frankly does not feel like a beginning of a performance), until about two hours into the piece. Throughout the whole duration, I am extremely impressed with her manipulation of time, something that I imagine would be much less effective in the theatre where time is so much more heightened and condensed. The dancers in Work are also hypnotizing. They move across the Atrium with so much force and clarity, carving out vortexes of space that spiral into each other and vectoring out into and through museum-goers . However, when coming back to Keersmaeker’s question of how choreography can be presented as an exhibition, I cannot help but to compare it to PLASTIC by Maria Hassabi, which is presented around at around the same time in 2016. Even though they are so different from each other, both of them last for the whole duration of the MoMA’s opening hours and both of them occupy the main space(s) in the Museum. However, there is something forced and lacking about Keersmaeker’s work that made it so much less effective than PLASTIC when presented as an “exhibition”. The biggest difference between an exhibition and a theatre performance is perhaps its mode of audienceship. While a theatre spectator signs a social contract to be as non-obtrusive and present as possible for the whole duration of a performance, a museum-goer is free to roam around an exhibition and to leave it whenever they want. Working with this challenge/ opportunity, both Keersmaeker and Hassabi choose to present their works as an ongoing choreography without any expected points of entry. 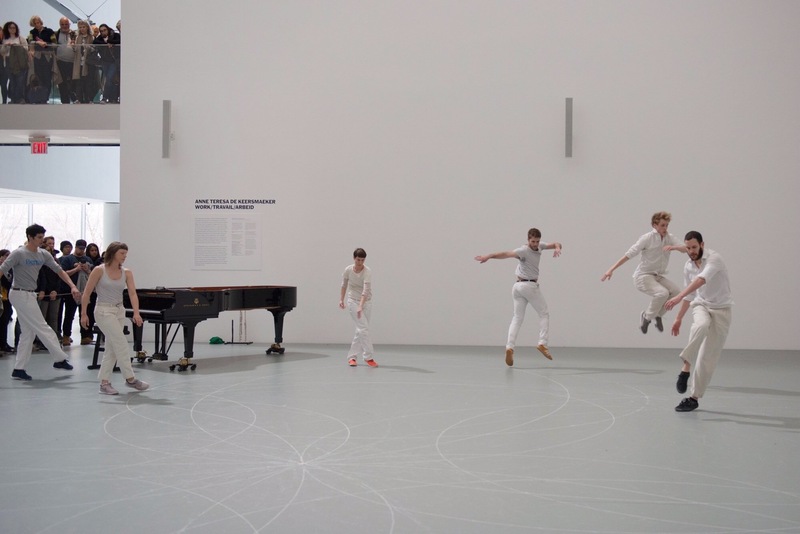 Nevertheless, if Hassabi is very effective in suspending and transforming the museum space by having bodies intervening with the formal architecture, Keersmaeker’s effort feels like an interjection of a mini-theatre within the museum. 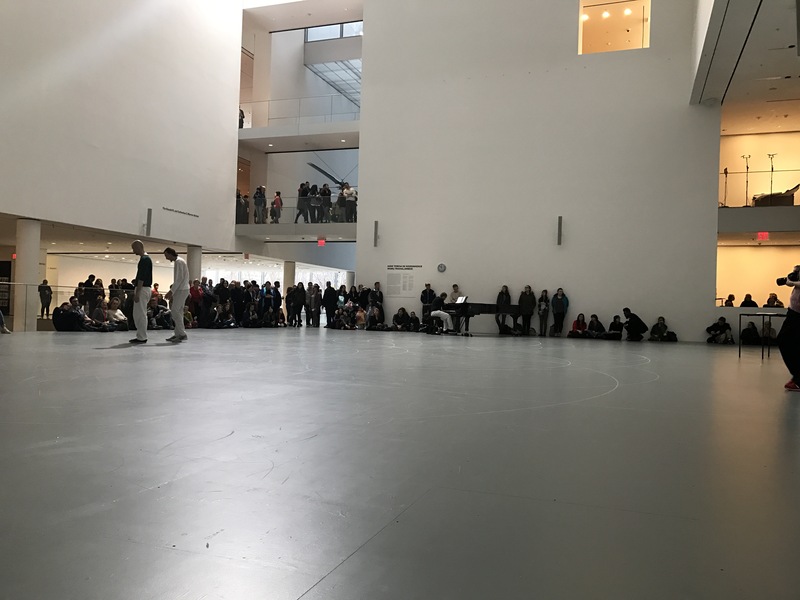 It creates an inorganically ambiguous situation where in theory, the audience can walk through the performance but in reality, the theatrical codes still dominates the environment, forcing everyone to sit quietly on the edges of the Atrium. Work/ Travail/ Arbeid falls a little bit short on its main question: “Can choreography be performed in the form of an exhibition?” It stops at simply being a question without proposing a radical imagination of the relationship between dance and the museum space. The work ends up being a diluted theatrical experience rather than a transgressive negotiation or perversion of an architecture that has traditionally privileged the conservation of non-corporeal materials. 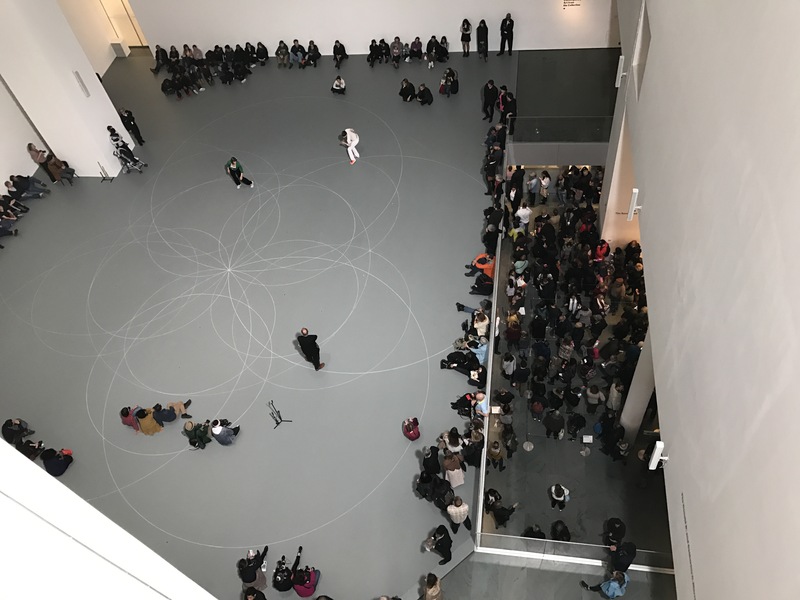 Nonetheless, Keersmaeker is entering a growing trend in dance of working with the white cube, contributing her rigorous thoughts on the possibilities of this new opportunity and challenge. Images sourced through MoMA’s website and personal collection. Posted in dance, Favorite.Tagged anne Teresa de Keersmaeker, Contemporary dance, experimental dance, MoMA, museum, Performance, reviews.